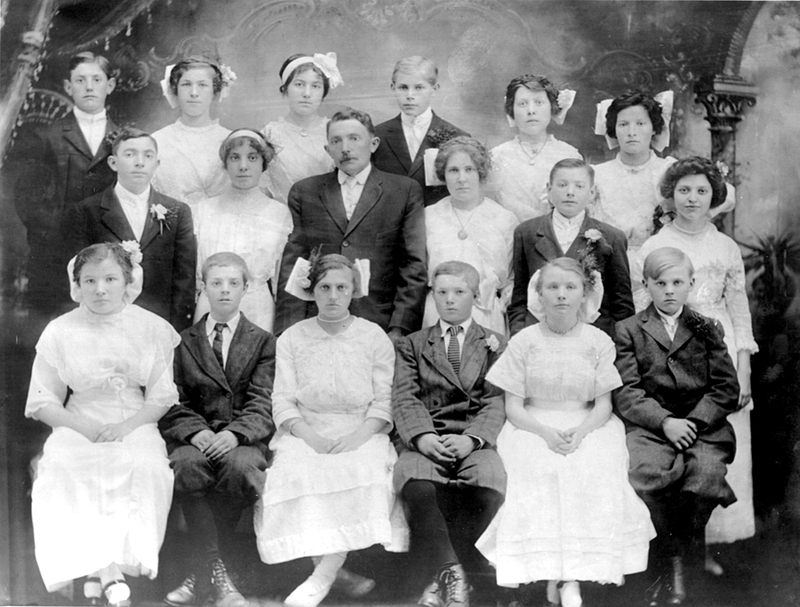 The April 5, 1914 Confirmation Class of the Free Evangelical Brethren Church. Front row from left to right: ?, Adam Rodermel (also Rudarmel or Rothermel), ?, Georg Rodermel (also Rudarmel or Rothermel), ?, ? Second row from left to right: ?, Elisabeth Döring (Derring), Elder Peter Yost, ?, ?, ? Back row from left to right: ?, ?, ?, ?, ?, ? The unidentified class members include: Peter Kniss, Peter Bauer, Friedrich Mueller, Jacob Mueller, Friedrich Gaibel, Rosalie Liebrecht, Paulina Hoelzer, Maria Jost, Eugenie Stukert, Elisabetha Jost, Margaretha Kreick, Catharina Fink, Martha Nuss, Anna Elisabetha Kildau. 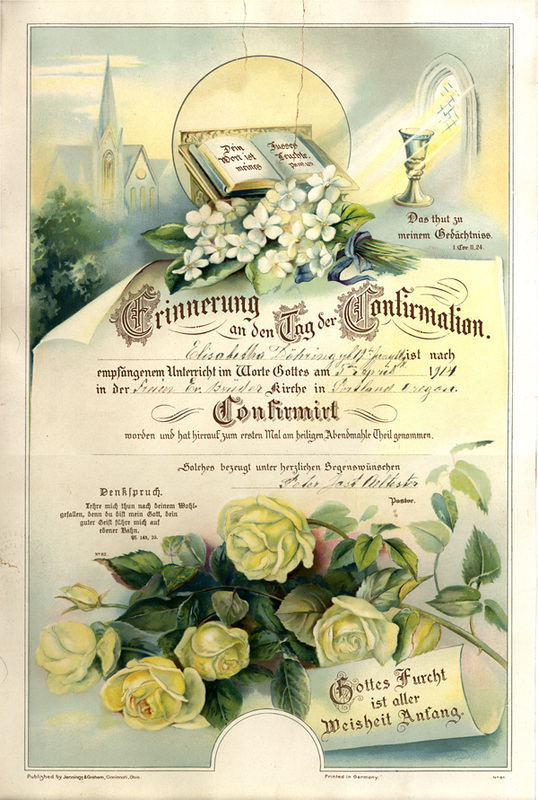 Confirmation certificate for Elisabetha Döhring (Elisabeth Döring) signed by Peter Yost. Courtesy of Elisabeth Schreiber (née Döring). Photograph and confirmation certificate courtesy of Elisabeth Schreiber (née Döring). Krieger, Joanne, Willis Krieger, and Marie Krieger, trans. Free Evangelical Brethren Church Records, Portland, Oregon, 1900-1922. Portland: Print. Names are spelled as shown in the translated church records. Alternative spellings are in parenthesis. Shelley Keenan identified her grand uncle's, Adam and George Rodermel. Steve Schreiber identified his grandmother, Elisabeth Döring.